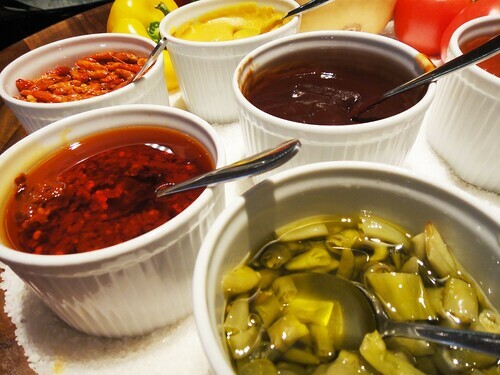 I used to have this recurring dream that I was at the most glorious buffet. I knew it was a dream as the food looked more beautiful, more luscious, more tempting than anything you could possibly imagine. I'd pile my plate high, and return to my seat, and just as I was about to dig in, I'd abruptly wake up. I don't think this means anything more profound than the fact that I am a pathetically greedy person. But the only thing I can think of that would be better than a buffet (apart from this one) is an all-you-can-eat that comes to me. And what an all-you-can-eat - men with meat - wielding huge whacking swords of the stuff (and we're back to the psycho-analysis). 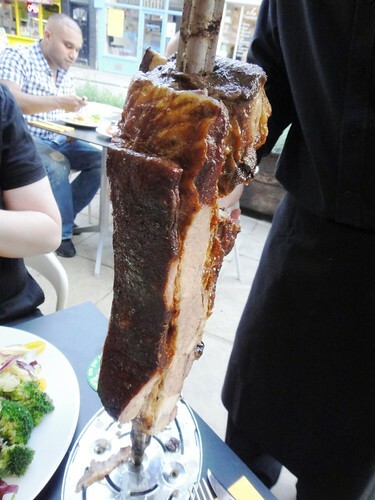 Rodizio-style churrascarias are a real dream; at these Brazilian steakhouses, an endless procession of butch, barbecued meat is brought straight to your table by the dashing passadores and carved onto your plate until you admit defeat. 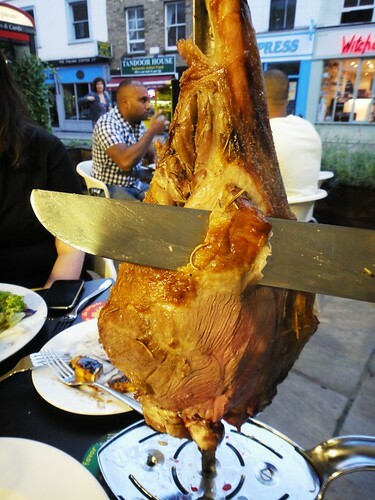 Rodizio Rico is such an establishment - unlimited 'prime cuts' and a buffet of side dishes costs £23.50, which is great value, especially if you're a glutton like me. So, I find myself living this dream one balmy summer night. Before the meaty onslaught, our hungry band visit the buffet to find some authentically stodgy Brazilian dishes like farofa, coxinha, pão de queijo, and bolinho de arroz (rice balls), but also random salads, slightly crummy lasagne and that buffet staple of boiled eggs. There's even banana frita, deep-fried banana in a crunchy bread coating which is just ... odd (I feel like I've come to the end of a Chinese meal). 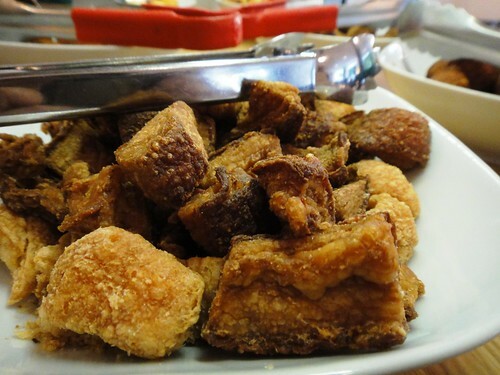 I'm most enamoured of the dish full of stellar pork scratchings, which I return to on more than one occasion. With full plates, we sit down on the terrace outside with our cocktails and the meat begins to arrive. 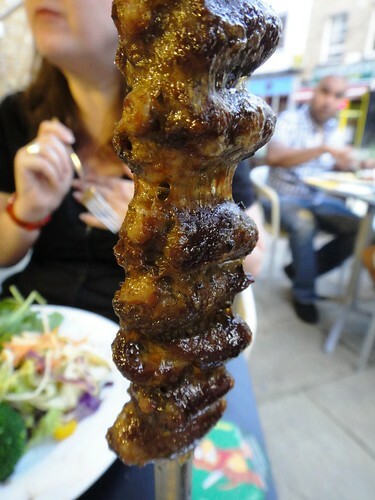 Skewer upon skewer of beef, pork and lamb (including some luscious Picanha ie top sirloin) melt in our mouths, having been seared beautifully on a charcoal grill beforehand. They also produce a mildly disturbing joint of beef oozing with cheese - I don't know why this throws me, as I'll happily eat this combo in a burger. As well as skewers, the passadores bring us great platters of ribs, steak, lamb chops, chicken wings, and my best beloved chicken hearts - all of them excellent. It's so much fun being waited on like this, and it's tempting to keep going all night. However, mindful that I''m not wearing elasticated trousers, eventually I find some restraint, and I stop the meatwave by turning round my handy "stop/go" sign to red (to be honest, by that point, I think I've lost the power of speech). I waddle my way home before desserts arrive to catch the last train - we're in Fulham which is a bit out of the way for me, but there are branches in Islington (where the buffet is "even better" I'm assured), Westbourne Grove and the O2. I've vowed to visit again the next time the meat-cravings hit. I expect that will be quite soon. 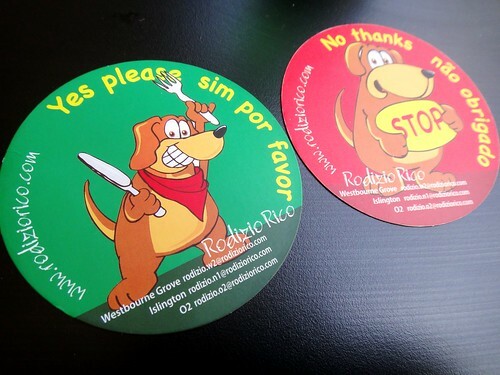 I dined as a guest of Rodizio Rico. Yeah, have since been to the one in Angel and the buffet is better BUT the selection of meats offered wasn't as wide-ranging as when we went on the PR night in Fulham - there was no lamb at all, for starters. Still really enjoyed it though and still think it's very good value. Even though I know I will probably never be able to eat at this restaurant I still enjoyed reading the post and drooling over the pictures. 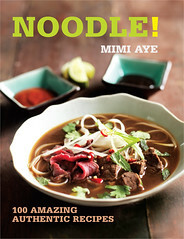 You make food writing actually enjoyable and worth reading! @Kavey - Ooh, then I might stick to Fulham. The buffet isn't a priority - the meat is! Rodizio Rico is AWESOME. We go to Westbourne Grove as it's nearest, we go quite rarely, and we prepare by not eating much/anything all beforehand. Can't wait to go again! I remember I went to the one in Westbourne Grove many years ago and stuffed my face silly. Your pictures had me drooling for some meat! I went to the one in Islington around a year ago and was quite disappointed that a lot of the meats had run out and they didn't tell us until we'd started eating. They gave us a voucher for a free drink the next time but that wasn't enough of a redeemer for us to return. @Alex @chasingbawa - Ooh, Westbourne Grove may have to be my next stop. @Lizzie - That's rubbish! Sounds like the Islington branch is a bit disorganised. And to think I just moved away from there. Boo :-( Great post. See, i read your post and thought, "ohh, better get to the Islington branch" as this wounds right up my street. But then the comments are making me think again. Still, you can't go wrong with a place like this, proper meat-a-geddon. How many servings did you manage? 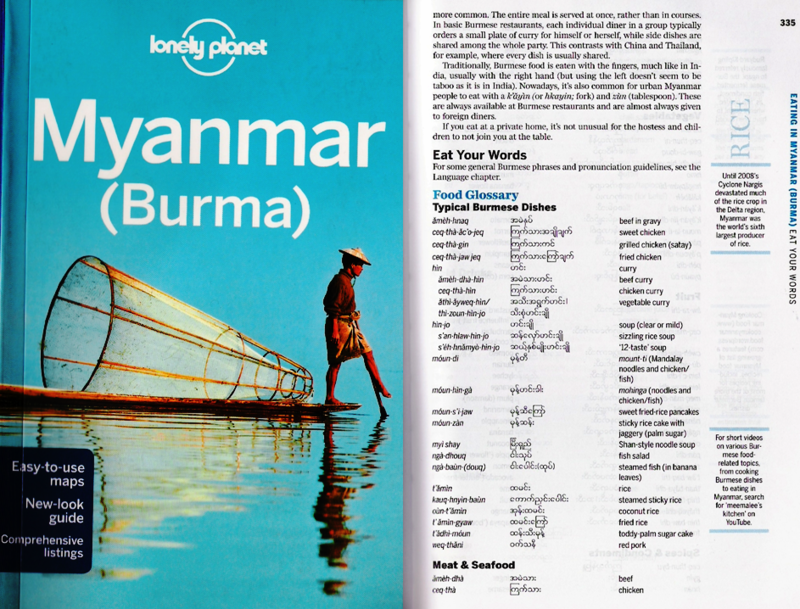 I'm slighty worried that going there would actually shorten my life... might be worth it though. 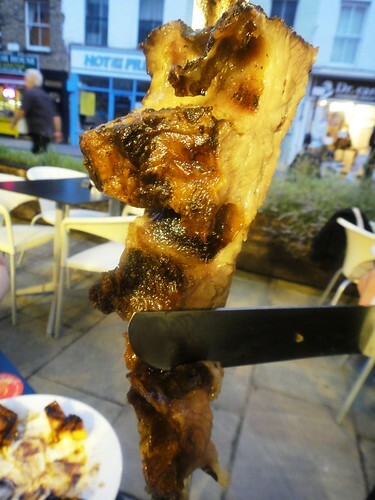 This looks so much better than the churracasria I had at rival Rodizio Preto. Just out of curiosity what time of day did you go? Might seem a weird question, but I wonder if there's an optimal time of day to visit such places. @Nicola - Thank you! You near any of the other branches? @Mr Noodles - Ooh, someone just told me they think Preto is better. 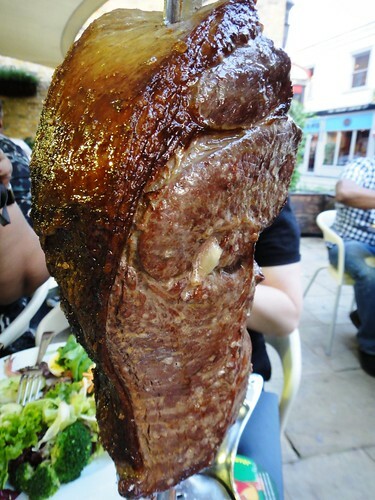 We were at Rodizio Rico at 7.30 on a Thursday.